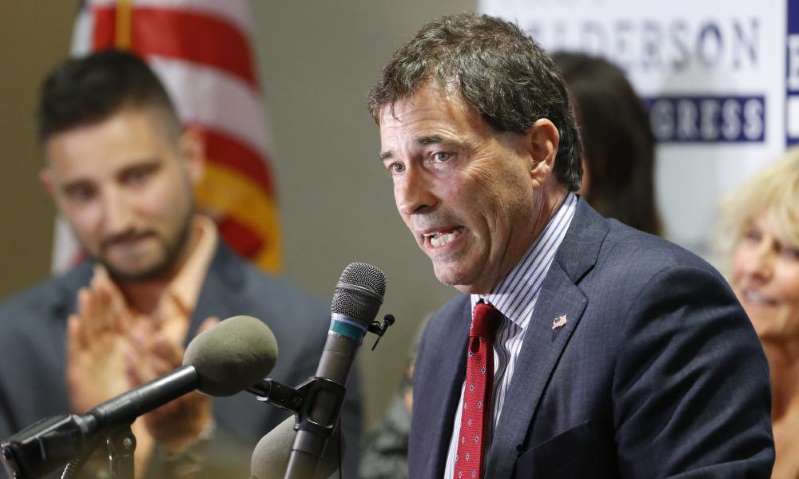 Troy Balderson appears to have narrowly held off Danny O’Connor in Ohio, although the race has not been formally called. On another night of critical primaries in advance of the midterm elections, another establishment Republican was beaten by an outsider sounding a Trumpian tone. This week, it was former Minnesota governor Tim Pawlenty’s turn to grapple with a party that no longer has room for his kind. Once seen as a fresh-faced leader with national appeal, Pawlenty was attempting to reclaim his old job. But he was decisively beaten by Jeff Johnson, a county commissioner backed by grassroots conservatives. The upset brought renewed focus on the direction of the Republican party. The irony of Pawlenty’s statement was not lost on those who have followed his career, in which he has always drawn heavily on his working-class roots. Although he lost his bid for the presidential nomination in 2012, he has remained prominent in Minnesota politics. Trump rose to prominence on a sharply anti-immigrant platform and proved immune to controversies that would have ended the career of any other politician. Pawlenty was among those who endorsed the former reality TV star in 2016. He rescinded his support in the wake of the Access Hollywood tape, in which Trump bragged about groping and kissing women without their consent. Trump, Pawlenty said then, was “unsound, uninformed, unhinged and unfit to be president of the United States”. Pawlenty faced other obstacles, among them the fact that he has been working in Washington, lobbying on behalf of Wall Street, at a time when the electorate is turned off by corporate interests and political insiders. Polling has shown that the Republican base is still overwhelmingly in favor of Trump. But the president’s low approval ratings at the national level present a challenge to Republican incumbents. They have found themselves attacked from the right, for being insufficiently zealous in their support of the president, while being squeezed from the left by Democrats energised by opposition to Trump. Trump has remained characteristically bullish. That tweet came the morning after a high-profile special election in Ohio was left hanging, Republicans struggling to defend a long-held House seat despite an 11th-hour appearance by the president. The 12th district, outside Columbus, was not meant to be competitive, Trump having carried it by double digits in 2016. Republicans were forced to pour millions of dollars into the race. The latest tallies show Troy Balderson beating his Democratic opponent, Danny O’Connor, although the race has not been formally called. It was not the only district that has unexpectedly come into focus. In March in south-western Pennsylvania, the Democrat Conor Lamb pulled off a major special election upset in a district Trump won by nearly 20 points. In order to take control of the House of Representatives for the first time since 2010, Democrats must flip 24 Republican seats while retaining 194. The party has experienced its own upsets – in New York in June, the progressive Alexandria Ocasio-Cortez beat Joe Crowley, the fourth-ranking House Democrat. Republicans have sought to link other Democrats to Ocasio-Cortez’s brand of socialism. But the 28-year-old is not yet a household name and is unlikely to be as potent an influence as a sitting president. Michael Steel, a Republican strategist who was an aide to the former House speaker John Boehner, said the Trump effect varied by district. But the president would ultimately be an asset, if he could help drive his supporters to the polls. Steel acknowledged that though Trump’s appeal remains strong among the Republican base, such popularity does not necessarily extend to college-educated and suburban voters, particularly women. In those cases, he noted, Republicans will have to distinguish themselves in their pitch to voters. Carlos Curbelo is a Republican seeking re-election in a Miami district that went for Hillary Clinton by 16 points. He declined to endorse Trump in 2016 and has expressed sharp disagreements with the president on issues ranging from immigration to climate change. Curbelo’s attempts to cast himself as a Republican willing to stand up to Trump have shown signs of bearing fruit, with even Democrats’ own polling finding him ahead. But for many Republicans, finding a distinctive message has been far from easy. Even when the president has taken the stump on behalf of conservative candidates, his rallies have often become repetitive rollcalls of his greatest campaign hits. Rather than emphasize the overhaul of the tax code or reversals of Obama-era policies, Trump has railed against the special counsel investigation into Russian interference in the 2016 election. He has gone to war with former intelligence officials and found his White House embroiled in controversy following explosive claims made by a former aide, Omarosa Manigault Newman. Steel said most within Trump’s party would prefer if he were able “to focus relentlessly on a disciplined message” around the economy and national security. But he pushed back against the notion that the president’s travails would have a trickle-down effect on the ballot. A rejection of Trump has, however, emerged as one of the central motivations of the so-called resistance. Democrats have seen a surge in turnout in primaries this year. Republican turnout has stayed relatively flat. “The bigger risk,” Conant said, “is that Republicans who have mixed feelings about Trump but voted for him because they couldn’t stand the thought of Clinton being president may stay home this fall.